The wedding breakfast is your first meal as a married couple so it’s important to get it right. We’ll help you plan the perfect meal to celebrate your new life. The wedding breakfast is a key aspect of your wedding. As well as offering an opportunity to relax and enjoy yourself with family and friends after the excitement of the ceremony, it will also be your first meal as a married couple – so it’s important to get it right. When it comes to planning the wedding breakfast, there are a number of things that you will need to consider. Obviously the most important part of planning your wedding breakfast is choosing the menu. But while it may be exciting, it can also be quite difficult. To help you select a menu think about the kind of wedding you are having. If you’re planning a traditional wedding, then a three-course meal with traditional British dishes such as a roast beef dinner would go down well. If you’re looking for something a little more casual you might want to treat your guests to a BBQ or hog roast instead. You could even incorporate a continental feel with Mediterranean tapas, or satisfy your guests’ sweet tooth with an English afternoon tea. For something a little more personal why not consider incorporating foods that have a special family meaning or that are associated with happy memories for you and your partner? Don’t be afraid to ask if you’d like something that’s not on the standard menu. Most caterers will be happy to work with you to create a meal that you’re happy with. The important thing to remember is not to get too hung up on pleasing everybody else. It’s your big day so make sure you choose something that you and your new spouse will really enjoy. As well as deciding on what food you will eat, you also need to think about how you want it to be served. For a traditional three course meal, a silver service would usually be appropriate. Or if your wedding is a bit more informal you might want to go for sharing boards or a hot buffet, which also give the added benefit of giving guests a wider choice of food. You could even go for dual approach and have table service for the first two courses followed by a serve-yourself dessert table. Whatever menu you choose you will need to make sure that you cater for any guests who have special dietary requirements, such as vegetarians, vegans, coeliacs, and people with food allergies. The best way to find out about people’s requirements is to ask them to let you know when they RSVP. Make sure you let the caterers know in plenty of time so that they can come up with some interesting (and tasty) options for your guests. If there will be kids at the wedding you will also need to think about what you are going to feed them. Will they have a smaller version of the adult meal or something completely different? Your caterer should be able to suggest some possibilities and help you make a decision. While the food is obviously the main event, don’t forget about the drinks. What drinks you serve, and how much you provide, will depend on the style of your wedding and the budget you have available. Generally speaking, most sit down dinners include half a bottle of wine per person plus a glass of bubbly for the all-important toasts. But if this doesn’t work for you feel free to offer something different – it’s your wedding after all. Remember to also cater for any non-drinkers; an interesting mocktail or fresh fruit juice will go down so much better than a glass of tap water. Food is an important part of any wedding, and is something that your guests will remember after the event. 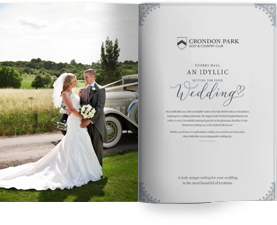 Here at Crondon Park, we understand the significance of the wedding breakfast; as a wedding venue in Essex we will work with you to meet all your catering needs and help ensure that your first meal as a married couple is one that you will remember for all the right reasons.